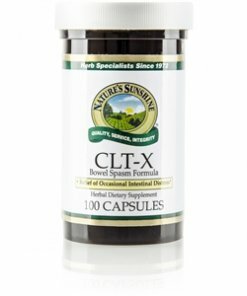 Nature’s Sunshine CLT-X combines slippery elm, marshmallow root, and ginger among other herbs to provide digestive support. Both slippery elm and marshmallow root are mucilaginous, a property that helps in soothing upset bowels or nausea. The addition of ginger to the CLT-X formula enhances its digestive support. Instructions: Take two capsules with a meal three times daily. For best results, use with Anti-Gas Formula.